Whether you're lighting a cigar or a barbecue grill, sometimes matches just don't last long enough to do the job. However, a way exists to keep that match lit as long as you need, and it will only take you a second to make it work. Light the wick that's inside of the votive, and let it burn until a fair amount of candle wax liquifies at the bottom. Remove two matches from the matchbook. Blow out the candle, and dip the tip of the first match into the wax. Relight the candle with the second match. Place the first, wax-dipped match tip into the candle flame. 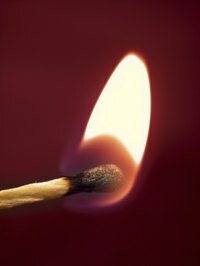 The wax-dipped match will hold its light much longer than would a normal match. YouTube: How to Make Matches Burn and Last Longer! Do Light Fixtures Have to Match Faucets & Drawer Pulls?